Based in the Appalachian Mountains, Brian Connolly is a certified nutritionist and has been writing professionally since 2000. He is a licensed yoga and martial arts instructor whose work regularly appears in ‚ÄúMetabolism,‚Äù ‚ÄúVerve‚Äù and publications throughout the East Coast. Connolly holds advanced degrees from the University of North Carolina, Asheville and the University of Virginia. Shaolin Kung Fu is a comprehensive collection of fighting arts that emerged or were adopted by the Shaolin Monastery in ancient China. According to the Shaolin Gung Fu Institute, students engaging in Shaolin Kung Fu exercises gradually learn the specific methods and techniques used in performing animal fighting styles. With practice, determination and a willingness to push your boundaries, practically anyone can engage in Shaolin Kung Fu exercises. 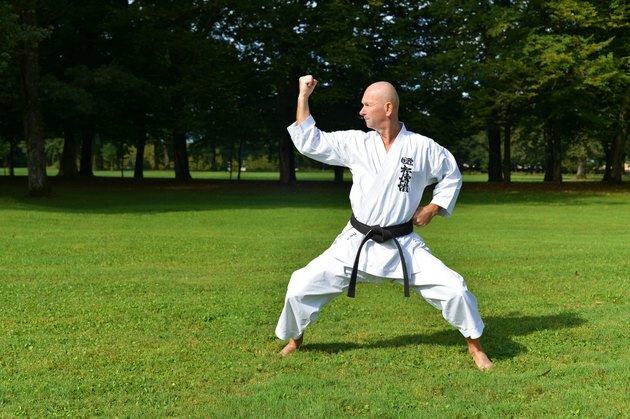 To properly perform the wide stances and sweeping attacks incorporated in more advanced Shaolin forms and techniques, students dedicate themselves to a daily regimen of flexibility training. According to research performed by the Shaolin Wushu Institute, students receiving training at the Shaolin Monastery frequently undergo splits and other leg stretches that push them to a state of controlled pain. One popular exercise involves lying on your back with two other Shaolin students holding your arms and legs still while the "sifu," or instructor, pushes your body down from the shoulders into a split. Solitary practitioners can reap similar benefits by placing their feet on two separate chairs, crates or other solid objects as they descend into a full split. While not recommended for the beginning student, this traditional Shaolin technique can make a lasting improvement to the strength and power of your strikes. Traditionally used as a black belt test for students graduating from the Shaolin Monastery's fighting curriculum, this exercise involves wearing a blindfold and breaking boards as you perform your Shaolin forms and techniques. Start this exercise by selecting a warehouse, garage or other spacious area and putting a blindfold on your eyes. Begin executing the different sequences of your Shaolin Kung Fu forms while another Kung Fu student holds a half-inch thick board at various points throughout your techniques. Restart the sequence from the beginning if any of your punches, strikes or kicks fails to fully break the board. Nearly all Shaolin Kung Fu forms either begin or end in the traditional horse stance. Aside from generating balance and strength for your offensive and defensive techniques, the horse stance is also an excellent leg-strengthening exercise that can be employed on its own at any time. Perform a basic horse stance by taking a wide step to your right until your feet are between three to five feet apart with your heels and toes parallel. Bend your knees slightly while keeping your back erect and tucking your tailbone forward slightly to maintain an even line with your upper and lower torsos. Maintain this intense leg-strengthening stance for one to three minutes or, for a real Shaolin exercise, until a stick of incense burns down to the stem. Shaolin Grandmaster: What Is Shaolin?